There is a marked change in the way people look at their bathrooms. Today, the bathroom doubles up as a place of retreat after a tired day. And to seek comfort, you have to think beyond the obvious. Yes, the Bubble bath and the scented candles will help. But do not underestimate the importance of colour in helping you relax. With the many colour choices, Granite comes across as the perfect choice of natural stone that will help you set the mood. You can choose muted colour hues that are naturally relaxing, with patterns and waves that energize and calm you down. Blue, Green and Greys are excellent choices. For the countertop, you can either choose a colour that blends with the faucets or choose one that stands creating the perfect contrast. And if you wish to extend the use beyond the countertop, you can choose to install them on the walls too. Blue Dahia is a rare and stunning granite that is a perfect candidate for use in the bathroom. With its deep blue base with a stunning array of gold and beige minerals, it reminds us of everything oceanic. Use it as a countertop and it will accentuate your golden faucets. Use it on the walls and it will remind you of everything aquatic. 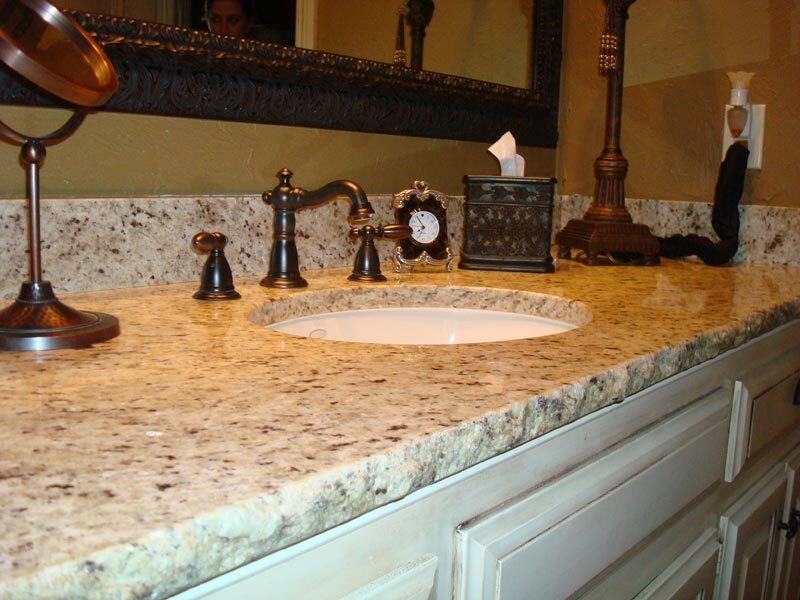 It is usually advised that you should make it a habit to wipe off any liquid that falls on a granite countertop. How can it be used in the bathroom where its contact with water will be a lot higher? This advice is usually doled out to homeowners who install granite for the first time in the kitchen to ensure that they make a habit of cleaning any liquid. Be it water, hot tea or chicken soup. This helps to maintain the sheen of the stone and prevent abrasive liquids like lime juice from damaging the sealer. Granite has excellent resistance to water. So even if there is water 24/7 on the walls or on the countertop, it will not really damage the stone. You can always check to see if the stone is beginning to absorb water and take remedial action (reseal). However, that is not usually required for the first four to five years at least. Considering that granite slabs are extremely heavy, if you decide to install them on the walls, transporting slabs that big may prove to be problematic. To offset this risk, some experts suggest breaking them down into tiles to make it more manageable. But that makes installation cumbersome. If you are only using it on the countertop in your bathroom in Toronto, then there shouldn’t be a problem.